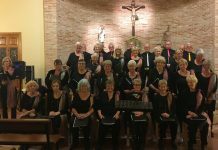 Home Football CD Montesinos WHO LOVES YA BABY! 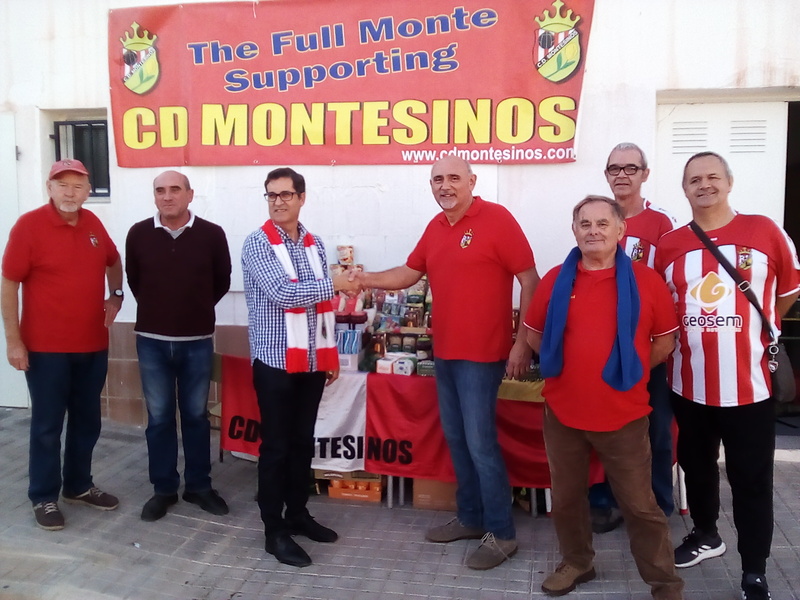 Los Montesinos Mayor José Butron with CD Montesinos supporters President Eddie Cagagio presenting the food donations for the municipal food bank. 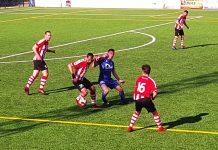 CD Montesinos hosted CF Rafal at the Campo de futbal Municipal in the 1st Regional Group 8 – with striker Vazquinho wrapping up the points from the penalty spot. 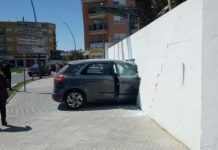 After a fraught season – in which coach Carlos Perez was given the sack last month – new hope was installed with the appointment of Ruben Saez Juarez. 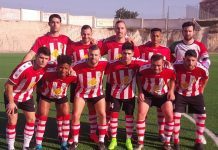 Ruben opened his account with a shock 1-0 win against third placed Santa Pola CF in late November -lifting CD Montesinos out of the relegation zone. Monte, in the lower echelons of the table, went into the game against ninth placed CF Rafal on the back of a hearty performance against league leaders Racing San Miguel, losing 1-0 on December 2. 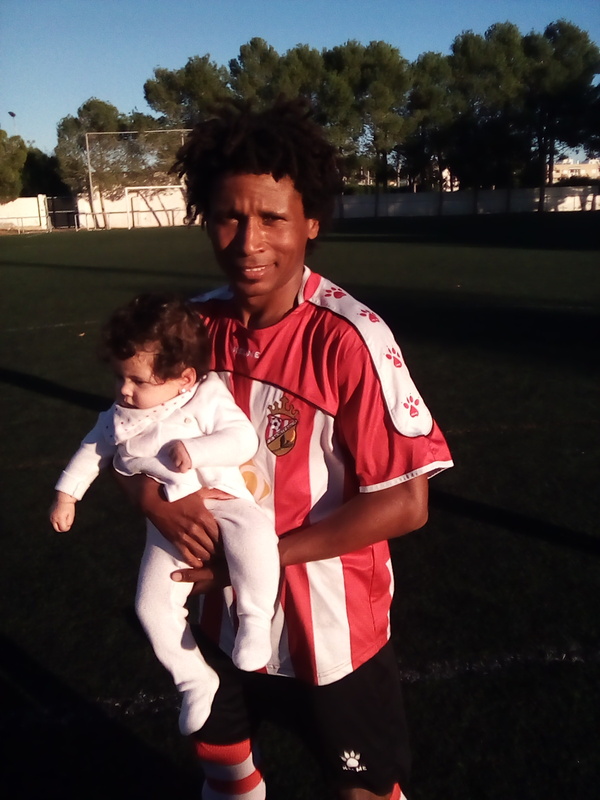 CD Montesinos Brazilian striker Vazquinho with baby daughter. Photo_Andrew Atkinson. Patri returned to the Monte line-up, named as a substitute, after serving a two match ban, with keeper Michael taking the green jersey from Carlos. 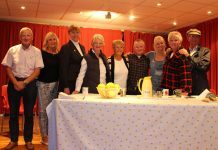 Striker Liam was ruled out with injury. Montesinos took the lead on 37 minutes through substitute German to lead 1-0 at the interval. Striker Vazquinho, who posed with his daughter in the pre match photo shoot, gave Monte a 2-0 lead when slotting home a spot kick on 80 minutes, running to coach Ruben in celebration.